Gov. 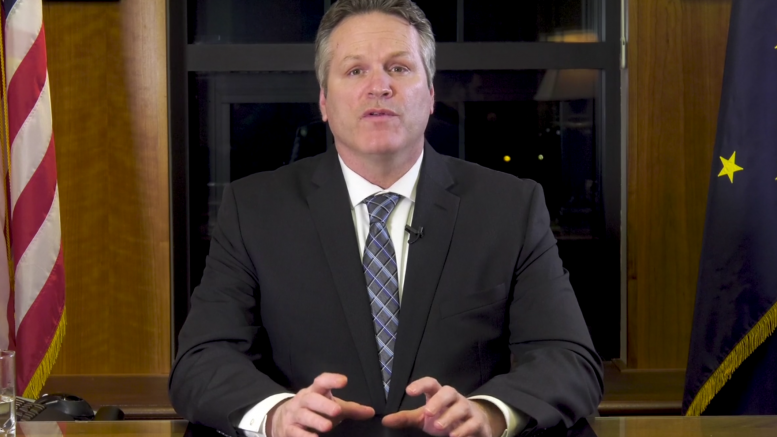 Michael J. Dunleavy in a prepared video address announcing his budget on Feb. 13, 2019. The University of Alaska saw one of the deepest cuts in state spending under the budget proposed by Gov. Michael J. Dunleavy—down $134 million from the $327 million received from the state this year, or a 41 percent cut—throwing the future of Alaska’s university system into deeper uncertainty after it already sustained years of deep cuts. With fears about cuts to programs, campus closures and higher tuition, Gov. Michael J. Dunleavy sent a letter to University of Alaska employees and students today not to offer any assurances or commitment to the university’s future, but to inform them that he didn’t really cut them as much as has been reported. In a letter—with a typo in the first sentence (though, I guess, who are we to point figners? )—distributed by University of Alaska President Jim Johnsen, Dunleavy says anyone who says he’s cut the university by 41 percent are wrong. Multiple people who received the letter pointed out just how wrong this claim is, noting that the remaining funding that Dunleavy apparently imagines will somehow stay intact would also plummet along with the cut. That additional funding comes from the federal government, research and student tuition, all dependent on the foundation built by the state funding. They aren’t guaranteed like the state funding is. Those are also sections of spending that he can’t touch by law because the university is independent from the governor under the Alaska Constitution. The only part of the budget that Dunleavy and the Legislature have control over is the undesignated general fund and that is cut by 41 percent. Fixating on the 17 percent figure is a tactic that’s been employed by Office of Management and Budget Director Donna Arduin, blogger Dermot Cole points out in his report on the letter, in order to downplay the cuts. “What’s needed is a second letter to correct all of his false and deceptive claims he makes about his disaster,” Cole writes. Johnsen has already said that to balance the cuts, the closure of a campus or doubling the tuition would be required. The letter from Dunleavy directly to employees and students is also notable given that the university isn’t under the governor’s purview, but the Board of Regents. They aren’t his employees. The two-page letter makes no other specific references to the University of Alaska. Instead, it goes on to blame former Gov. 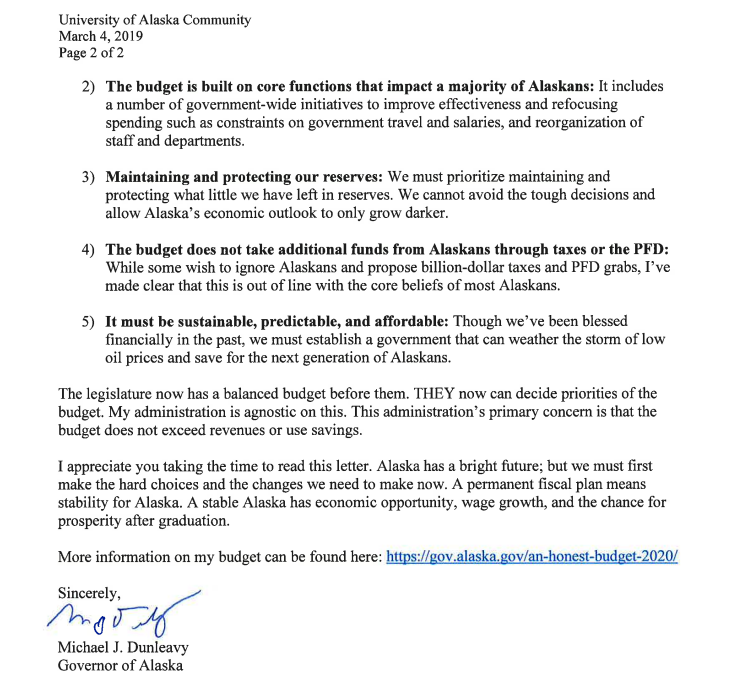 Bill Walker for spending down savings, outline Dunleavy’s budget principles (which he’s not even really following) and shifts the responsibility for the future of the university—and Alaska—to the Legislature. “The Legislature now has a balanced budget before them. THEY now can decide priorities of the budget. My administration is agnostic on this. This administration’s primary concern is that budget does not exceed revenues or use savings,” he said. If Alaskans were looking for vision, there is none. 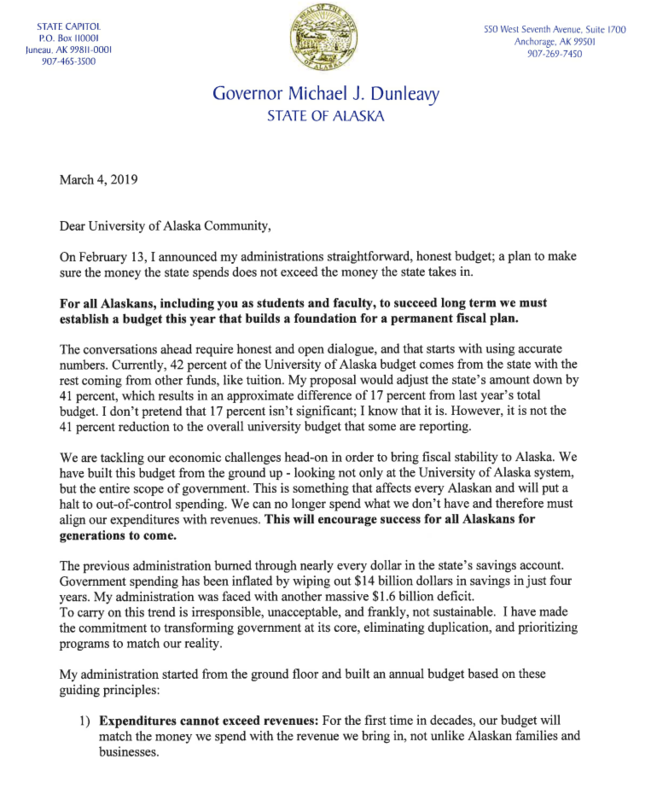 3 Comments on "Dunleavy to the University of Alaska: I didn’t really cut you that much"
Is it strange that our Bible-thumping Governor doesn’t know what “agnostic” means? Is it strange that our Bible-thumping governor doesn’t know what agnostic means? First end every tax credit to Big Oil, State Representatives and State Senate work with Governor Dunleavy to find a solution to this problem,that means you give him respect and you obay his commands, you stand at attention and say Sir yes Sir Governor Dunleavy now drop and give me 50.